Welcome to Day #2 of Chocolate and Coconut Theme Week. 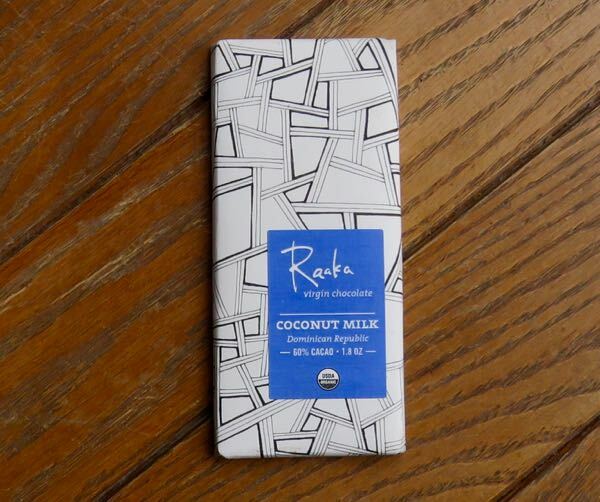 What better way to celebrate this week than with a small batch dark 60% chocolate Coconut Milk bar from Raaka Virgin Chocolate (Brooklyn, NY)? Raaka makes their gluten and soy free, organic chocolate with un-roasted cacao. Today's single origin (Oko Caribe Co-operative, Dominican Republic) bar offered a concentrated blend of authentic cacao and coconut flavor. Added cocoa butter gave it a relatively smooth texture and slightly buttery melt. 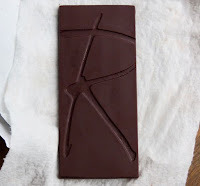 This Coconunt Milk (shredded coconut ground with cacao) dark bar offered a less sugary sweet and more flavorful cacao experience than most chocolate coconut treats.